Autonomous Freight Truck in the U.S. The Freightliner Inspiration Truck has a Level 3 autonomous vehicle operating system that enables the driver to cede full control of all safety-critical functions under certain traffic or environmental conditions. Using cameras and radars, as well as lane stability, collision avoidance, speed control, smart braking and intelligent steering systems, this autonomous freight truck can stay within the proper highway lane and legal speed limits as well as maintain a safe braking distance from other vehicles, thus allowing it to safely slow down or stop as traffic conditions change. In certain situations (such as when the truck exits the highway, drives on local roads or attempts to dock at a warehouse) the driver is always in control. The Inspiration Truck also showcases Daimler’s platooning technology. When “Highway Pilot” is turned on, two or more properly equipped trucks can use vehicle-to-vehicle communication technology to automatically reduce the gap between them to about 25 feet (7.6 meters), locking them into platoon formation thus using up to 6 percent less diesel than when trucks are traveling by themselves. A very detailed review of all the highlights, innovations and amenities of the Daimler Freightliner Inspiration Truck can be found at the TopSpeed website by clicking here. To improve fuel consumption, reduce accidents, cut highway congestion, and ultimately offer a greener alternative to freight truck shipping. What are your thoughts on the Daimler Freightliner Inspiration Truck? Comment below! Chinese Takeaway Meal Delivery By Drone? 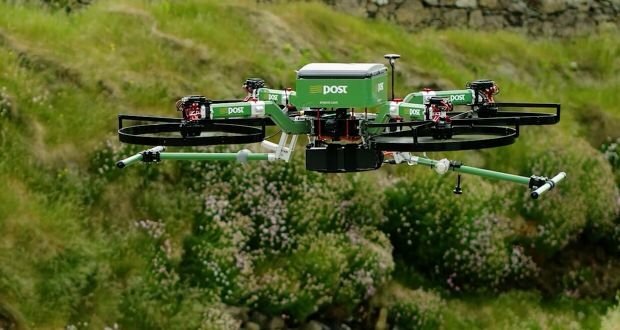 Join the Delivery Drone Revolution! Weekly delivery drone news summary newsletter is live. We will never share your email with anybody!